Have a question on MG 360? MG 360 is available in 4 different colors - White, Black, Gold and Silver. The most affordable of the whole lot of MG, the MG 360 is an entry step into the world of this British marquee. This entry level sedan promises to offer big car experience by being the most spacious car in its category, along with being feature rich and adequately powerful. In UAE, the MG 360 is available with only one powertrain option and in two different variants – Standard and Comfort. On the inside, things start becoming more premium with an increased feel good factor. You do get the choices of an all black cabin or a dual tone black and beige one, with the latter one being more premium in feel. The MG 360 comes with a rather simple looking steering wheel, however, the instrument console looks quite fresh and very modern with digital readouts. The yacht like theme for the dashboard with a silver or faux wood stream running in the center looks nice. While the upper layer of the center console houses a touchscreen infotainment system and vertical AC vents besides it, the lower one comes integrated with buttons for climate control. With the longest wheelbase in its class, the MG 360 offers the best in class knee room and headroom. And the list of features for this segment is equally impressive as well. You do get height adjustable driver’s seat, touchscreen infotainment system with reverse camera and navigation, automatic climate control, tilt adjustable steering, cruise control, and a sunroof as well. The MG 360 is a cost-effective offering, which is quite evident from the way it looks. It looks smart but quite basic, which can be a hindrance to its popularity among the next-gen buyers. 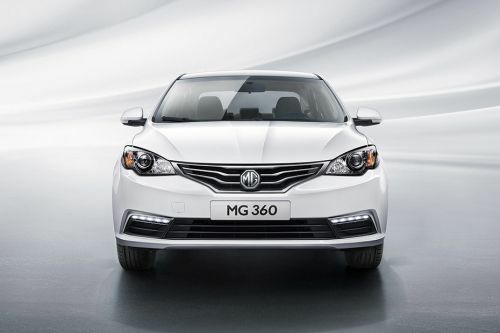 At the front, the MG 360 has got a smiley like a grille, which comes with two sleek kink shaped chrome slats. The headlamps are curvy yet sleek and do integrate projector units within them. You also get daytime running LEDs as a part of the package. It is the side profile which makes the MG 360 look quite boring. The car has a conventional three-box stance with a strong prominent character line running all the way from the edge of the front headlamp to the rear tail lamp. The only noticeable thing here happens to be the nice chrome garnish on the window waistline. At the rear, the MG 360 looks quite big, thanks to its wide stance and large tail lamps, which do accentuate its big car like stance. The MG 360 offers a plush ride quality, thanks to the soft suspension setup as well as aptly sized 16-inch wheels. The car is equipped with Macpherson struts at the front and a U-shaped torsion beam at the rear, which is tuned on a softer side. In terms of braking, the MG 360 has been equipped with front disc and rear drum brakes, which do get the assistance of electronics like ABS, EBD, Brake Assist and Cornering Brake Control. The MG 360 is powered by a 1.5 liter four cylinder petrol engine, which is a detuned version of the engine of the MG 6, sans the turbocharger. The engine, mated to an old school four speed gearbox, produces 110PS of maximum power and 135Nm of peak torque output. The engine feels refined, with linear power delivery helpful for both city as well as highway runs. MG offers a fuel efficiency of 6.3 liters per 100 km, which is quite impressive for a car of this class and performance on offer. The MG 360 has been blessed with all the essentials when it comes to safety features, such as dual front airbags, ABS with EBD and Brake Assist, engine immobilizer, tire pressure monitoring system, cornering brake control, cruise control and reverse parking camera with parking sensors. The MG 360 might not appeal to those who are after cutting edge designs and technologies. However, what this car offers is sheer practicality, all thanks to the spacious cabin, adequate and essential features, a moderately powerful engine and decent fuel economy, making it a perfect first family car. What is the price of MG 360? On road prices of MG 360 in starts from AED37,900 for base variant 1.5VCT STD 4AT, while the top spec variant 1.5VCT DEL 4AT costs at AED47,900 . What are the colors options available in MG 360?